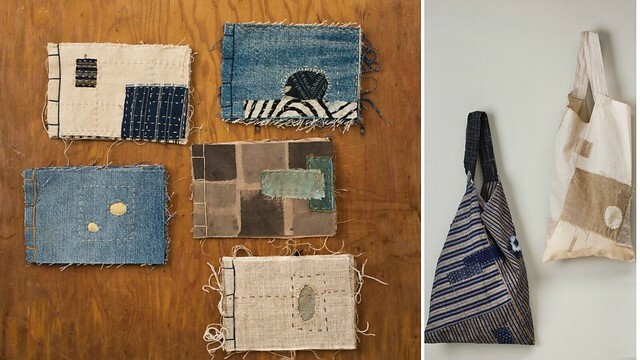 Description: Boro is a word used to describe Japanese textiles that have been pieced, patched, repaired and passed down from generation to generation - utilitarian objects that are rich and sumptuous and that, although old in age, possess a contemporary aesthetic. You'll learn Boro-specific stitching, patching and mending techniques and use them to create a Japanese Side-Sewn book that will serve as a reference for future mending projects. Then, on day two, you'll turn a length of cloth into a traditional Japanese-style bag (either a tsunobukuro or an azumabukurothat) that can be used as a project bag, shopping bag, or as wrapping for a very special gift. You'll leave with plenty of inspiration for future projects! Jody Alexander is an artist, bookbinder, librarian and teacher who lives and works in Santa Cruz, California. She combines textiles and found objects with discarded books, and gives them new life as scrolls, wall pieces, books, sculptural objects and installations. Her current work is inspired by the art of repair, mending techniques, and reuse. You'll find her work appears in a number of publications, including Masters: Book Arts: Major Works by Leading Artist, 500 Handmade Books, and 1000 Artists' Books: Exploring the Book as Art and she is the author of The Boro Aesthetic. Experience Level: All, from beginners wanting to learn hand stitching to experienced makers wanting to incorporate a new aesthetic into their work. ​Additional Supply Fee: None, but Jody will have some linen/cotton blend fabric pieces for bags available for purchase. Student Scholarships: There is one student scholarship available for this workshop. Scholarship applications are due two weeks in advance of the workshop. Only deserving requests will be awarded; application does not ensure acceptance. Please note, there is a 6-hr volunteer commitment in exchange for the scholarship (3 hrs. per day of the workshop). If you have trouble registering or paying (Safari users!) or if you are concerned that this website does not have an https address, please use the following direct link for registration and payment: https://sefaa.secure.force.com/Programs/CnP_PaaS_EVT__ExternalRegistrationPage?event_id=a0u0V00000mhHxyQAE.